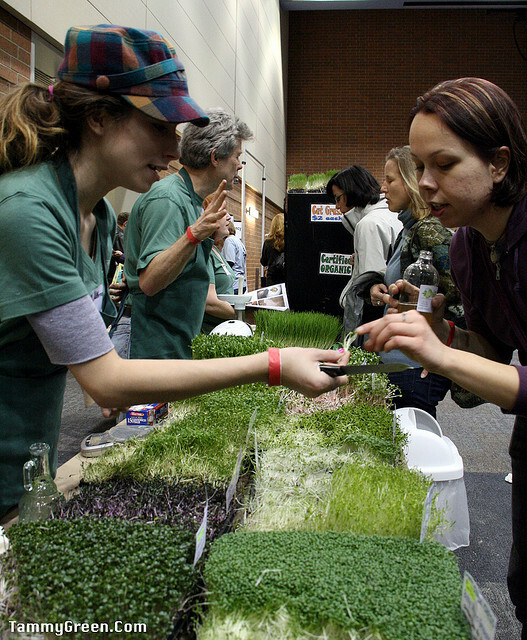 If you’re looking for an alternative to St. Patrick’s Day festivities, consider attending the Good Food Festival at the UIC Forum (725 West Roosevelt Road) this Saturday. The Festival is a chance to meet Midwest artisan food producers and farmers, attend workshops on growing and making food, and watch chefs demo tasty dishes. I always take away ideas about how to improve the way I eat along with a list of new foods to explore and a desire to make a bigger impact in the world around me. One of the hottest sessions at the Festival will no doubt be the Butchering and Sausage Making demo by Chef Rob Levitt of The Butcher & Larder (1026 N Milwaukee Ave.) and John Louis Slagel of Slagel Family Farms. Levitt has spoken at previous festivals about the importance of using the whole animal in cooking and his commitment to supporting humane treatment of animals. However, since Levitt frequently holds demonstrations at his butcher shop, I may skip it in favor of The Four Season Master Plan to learn new ways of making and preserving food throughout the year, or I may go to the pickling session with Chef Paul Virant. Sessions on bee keeping, GMO’s, composting, and raising urban chickens round out an afternoon of informative and thought-provoking presentations. If you’re shy about asking questions in front of a crowd or just want a private word with your favorite chef, these sessions provide a great opportunity to connect with the leaders in the Chicago food community. If there are particular presentations you’d like to see, it’s worth signing up in advance of the Festival. Tickets are available through the Good Food Festival site. Tammy Green is the co-founder of restaurant review site, Chicago Bites, a local and independent collaboration of talented people interested in eating well. She’s been eating for years, but didn’t discover her professional fascination with food until she started talking about it every week. As a result of Chicago Bites, she has expanded her interest in food policy, gardening, canning, composting, organic issues, slow food, local producers and chefs and how these all impact the Chicago dining experience. This entry was posted in Dining and tagged Family Farmed, Good Food Festival, John Louis Slagel, Paul Virant, Rob Levitt, Slagel Family Farms, The Butcher & Larder. Bookmark the permalink.